Just about everybody loves hummus. We were at a party recently where hummus was the most popular item by far. It’s super easy and inexpensive to make and is even healthy! I’m calling this All-Star Hummus because it received the most stars at AllRecipes for a hummus recipe. And it only takes 10 minutes to make! If you try all of those suggestions, I’m sure it will take more than 10 minutes to make. You can decide which changes are worth it to you. 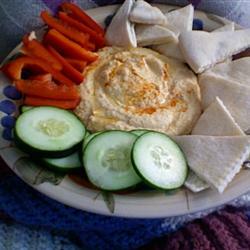 Hummus is made with chickpeas (also called garbanzo beans) a legume. So you can easily combine proteins by having hummus with chips or bread (grains). This could be a meal if you serve some veggies on the side. We love baby carrots, sugar snap peas, red bell pepper strips, and cucumber slices as dippers. Any raw veggie works. My granddaughter eats an enormous amount of hummus with broccoli dippers or chicken pieces! If you have any leftover it is great spread in a pita pocket with other sandwich ingredients added. Yum. Click here for this great recipe at AllRecipes. It’s a keeper. Thanks, ael! Getting there. I love hummus too. My daughter-in-law serves it with warm pita quarters. So good.